David Brennand is a partner in the Financial Services practice in Katten Muchin Rosenman UK LLP. David provides advice to a wide range of clients active in asset management on a broad spectrum of matters pertinent to their operations, with a particular focus on advising asset managers on the structuring and ongoing operation of hedge and other alternative fund structures investing in a diverse range of asset classes. In addition to his knowledge and experience in structuring more mainstream hedge and other products, David has particular experience in structuring hybrid funds, including funds investing in shipping and freight derivatives, real estate and real estate derivatives and international infrastructure projects. 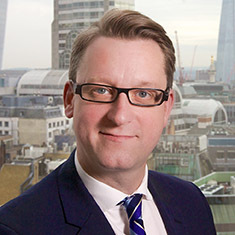 As well as advising on fund structuring and their ongoing operation, David's experience also extends to advising asset managers and other market participants on fund and management restructurings and on negotiating the structures and terms applicable to managed accounts, seed capital arrangements and illiquid portfolio acquisitions and divestments. David also represents institutional investors in connection with their acquisitions and disposals of investments in alternative investment funds and also has significant experience in advising financial institutions, asset managers and institutional investors on a wide range of fund-related corporate transactions employing various structures.